Research shows distracted driving increases the risk of a motor vehicle crash, the top cause of death for Mississippians under 45 years of age. Despite known risks, many people continue to use mobile devices while driving, a leading cause of driver distraction. To address this growing problem, in 2015, the Mississippi Legislature enacted a ban on texting and accessing social networking sites while driving. This law will expire in 2018, unless it is reauthorized by the Legislature. 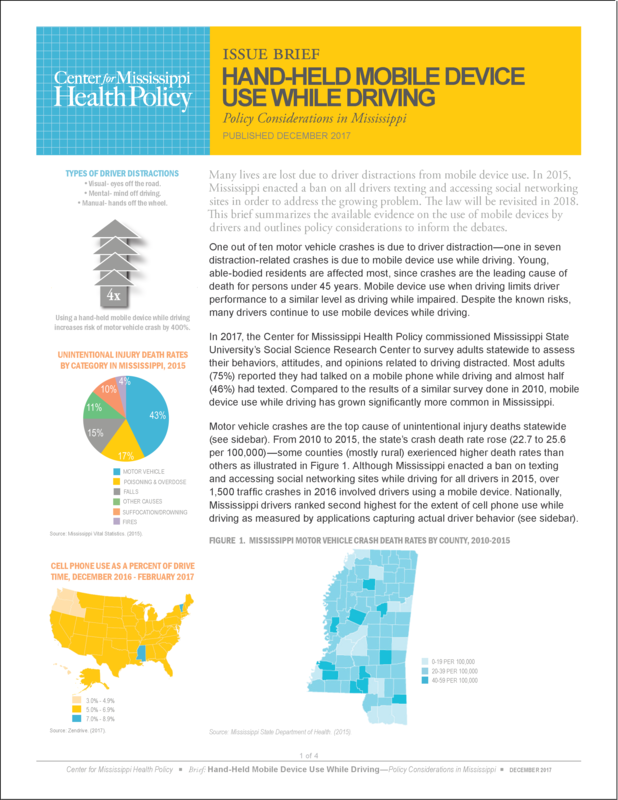 In 2017, the Center for Mississippi Health Policy commissioned researchers with the Social Science Research Center (SSRC) at Mississippi State University to survey adults statewide to assess their behaviors, attitudes, and opinions related to distracted driving. Results were compared to a similar survey that was conducted by SSRC for the Center in 2010. The Center also analyzed distracted driving policies in other states and examined evidence related to their effectiveness. The results of the survey and policy analysis are summarized in an Issue Brief. More detail on the results of the survey can be found in an associated Chartbook. Three-quarters (75%) of Mississippi adults reported they had talked on a mobile phone while driving, and nearly half (46%) had texted while driving. 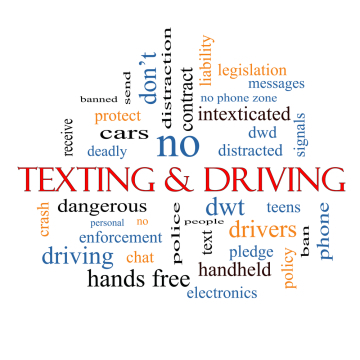 Three out of four (75%) adults in Mississippi reported awareness of the law banning texting while driving, and most (54%) said they had stopped texting while driving after its enactment, while another quarter (25%) said they had reduced this behavior following passage of the law. No state bans all mobile phone use (including hands-free) for drivers. Safety campaigns coupled with aggressive enforcement are effective in reducing distracted driving behaviors. 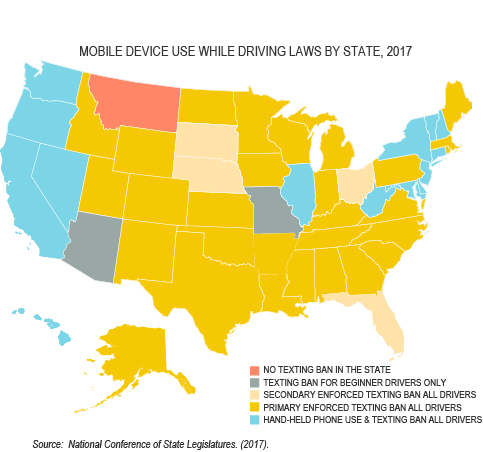 Laws banning all hand-held mobile device use while driving have been more effective in reducing mobile device use than other types of enacted bans. 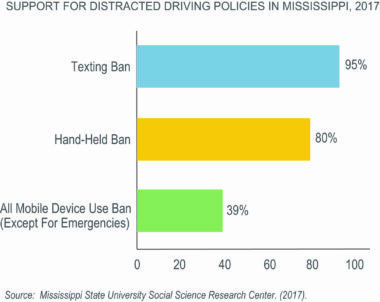 Nearly all (95%) Mississippi adults surveyed expressed support for texting bans; a large majority (80%) supported hand-held bans, and some (39%) favored bans on all use of mobile devices while driving except in emergency situations. To download a copy of the Chartbook click HERE.